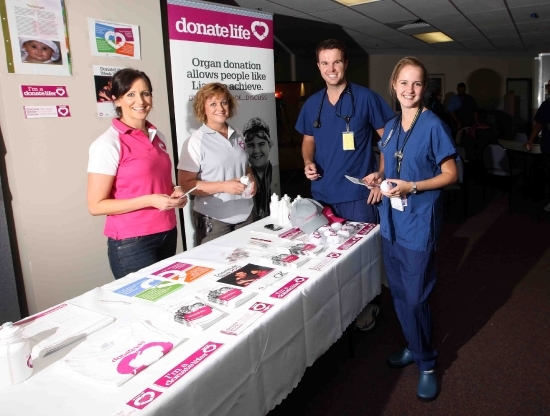 DonateLife Week will kick off this Sunday, with public events across the country.The campaign will encourage Australians to ‘make their wish count’ by talking to families about organ and tissue donation. VO: Two (2) years ago, doctors told Jennifer Ahmed she had only 20 percent capacity in her lungs and required a transplant. Close up of Jennifer’s face. Six (6) weeks later, a kind stranger gave her what she desperately needed. Close up of Angela talking This week, DonateLife hopes to save more lives by encouraging Australians to talk to their families about their wishes of becoming an organ donor. Close up of promo shirt saying ‘know your loved ones’ donation wishes’ Although eighty (80) percent of Australians are willing to become donors, the organisation says forty four (44) percent of people don’t know the donation wishes of their loved one. Close up of t-shirt saying ‘organ and tissue donation save lives’ One organ and tissue donor can transform the lives of more than ten (10) people. Low angle, peering up at the three ladies talking on park bench. Since her surgery, Jennifer Ahmed is living and breathing normally again. Close up of Jennifer’s back, neck and hair, sitting while looking at lake) She says she keeps in touch with her donor’s family and thinks of them everyday. Low angle, showing women walking around corner. DonateLife is holding a public event at Ballarat’s Botanic Gardens at 10am this Sunday. Long shot from behind of women sitting on bench and talking in front of lake. Brianna Piazza, WIN News.